If you have an iron will -- and don't mind bumping elbows with a couple hundred other women -- you'll probably do just fine at the District Sample Sale. If you have an iron will (and don't mind bumping elbows with a couple hundred other women), you'll probably do just fine at the District Sample Sale. Tickets for the next one went on sale today, and -- well, if you've ever been before, you've already ditched this window so you can go snap up your admission. If, however, you're still reading, that means you've never been. 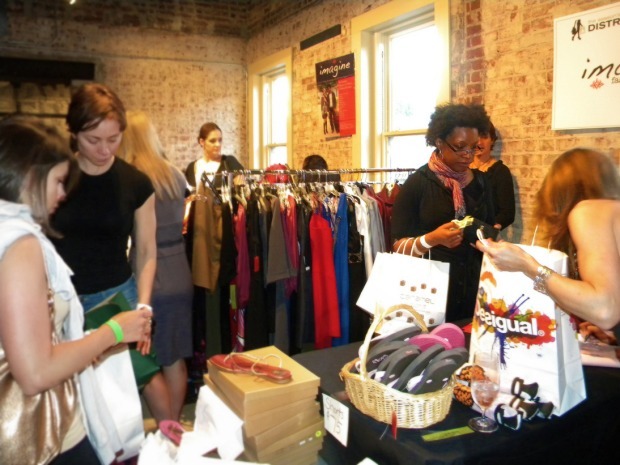 The District Sample Sale happens twice a year, with the next one coming Monday, Sept. 26. More than 20 local boutiques and vendors will bring steeply discounted merch from the previous season, as well as previews from the new season with some small discounts as well. Of course, your best buys are always going to be in the off-season stuff. While there, enjoy cocktails, great eats -- from places like Cuba Libre, Hudson, Napoleon and Georgetown Cupcake -- plus silent auctions and makeovers (thanks to one80 Salon's blowout station). Tickets are $40 for general admission (6:30-9 p.m.), or $100 for VIP, which includes admission an hour early (in our experience, it's very worth it) and a VIP goodie bag. A note to the returnees: The sale is moving to another new venue this time around, 1919 M St. N.W., after only one go-around on L Street this past spring. Its former Georgetown space was lovely, but unbelievably steamy no matter what time of year, so here's hoping this new spot could be a keeper. The sale benefits a different charity each year. Since 2006, the organization has donated more than $240,000 to various organizations. This fall's event will benefit WEAVE (Women Empowered Against Violence). Get tips on making the most of your DSS experience here.